Life in Beldon Grove on the Illinois frontier in the 1840’s isn’t easy. For Ellie Craig, the graves of her three infant children make it unbearably lonely, despite the love of her husband Matthew. When she uncovers a family secret that suggests she may not be as alone as she thought. Ellie is determined to find the truth. Meanwhile, Matthew Craig faces controversy in the church he pastors when a man arrives in town claiming to be both a minister and the son of the town’s founder. Will Matthew find the courage to reclaim his church? Or will he return to itinerant preaching, leaving Ellie even more alone than before? What a sad, sad story this begins as. It continues the sadness, loneliness and melancholy throughout until near the end when the bright light of hope appears briefly. Undoubtedly the story is quite realistic and reflects the poverty of the times as well as the many losses they experience without medical care. I thought the illness of little Julia was interesting in that a diagnosis is never given and yet it seems that much was being made of something that would definitely have been a cause of SIDS now and back then. That illness I am speaking of would be caused by botulism picked up through the honey that the family was enjoying on their bread and by spoon. The picture of the baby drizzled in honey from eating the treat and the two girls having to bathe her is one I could easily picture. It is sad that such a treat could cause such illness. This is, of course, my own interpretation and others are welcome to disagree. Being a Pastor’s wife myself, I find myself overly sensitive to the depiction of Pastor’s and their families. I did not enjoy the character of Pastor Matthew and did not like how he was such a “bull in a china shelf” and created judgements of others so quickly. Ellie I could empathize with more but there still didn’t seem to be much about her to like. She seemed to neglect her two middle children which bothered me throughout the novel. The choices that Ellie’s aunt Ruby made were somewhat shocking, especially for the times back then. The relatives in Texas and how that was finally wrapped up seemed so implausible to me that I inwardly groaned. 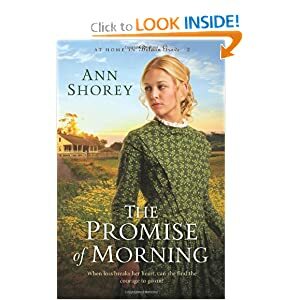 This is the second book I’ve read by this author and I was sadly disappointed by The Promise of Morning. It has a great theme of forgiveness and reconciliation and in this way it tells a lovely story. If this is what you are looking for in a good read, then you may enjoy this novel.